INTEC proudly introduces the Car Vision® CVD650LCD High Performance Color Display! Utilizing all state-of-the-art electronics, the CVD650LCD displays a crisp and vibrant image from up to 5 cameras. Designed and manufactured specifically for heavy duty vehicular applications, our newest display incorporates a high resolution digital LCD panel which triples the pixel count and a LED backlight for greatly improved brightness and a wider viewing angle. We have also improved the software in the CVD650LCD for user-friendly operation. With a Certified IP68 rating and FIVE YEAR warranty, you can be sure this display will give you the many years of reliable service you expect from INTEC. In 1978, INTEC introduced Car Vision®, an advancement in CCTV technology to provide an extra margin of safety to operators of large vehicles by eliminating blind spots. 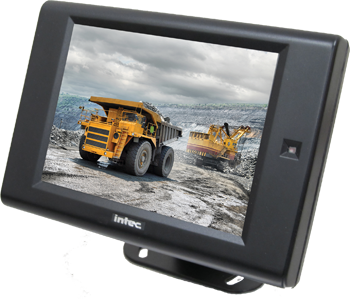 INTEC now provides a product line of over 30 cameras and monitors, in black & white and color. The originator of rear vision, INTEC has remained on the cutting edge of innovation by constantly developing and improving our safety camera systems using the latest in electronics technology. Maneuvering large garbage trucks in difficult spaces and places can be extremely hazardous. Pulling out from residential and city curbs and monitoring what’s being collected add to the every-stop demands placed on the driver. With the use of video cameras, drivers can eliminate blind spots and be watchful of the surroundings, workers, pedestrians, and impatient commuters who may not be paying attention. Want to become an INTEC Dealer?